Vitamin A - cell development, hair skin, nails, vision, immune system. Vitamin D - bone and calcium absorption. Vitamin B - energy production, thyroid, hormones, nerve structure and red blood cells, lowers cholesterol. Minerals - maintains glucose levels, healthy immune system, blood pressure and metabolism. Vitamin A, Vitamin C, Vitamin D, Vitamin E, Vitamins B-1, B-2, B-6, B-12, Niacin, Niacinamide, Folic Acid, Biotin, Choline, PABA (Benzoic Acid), Inositol, Panthothenic Acid, Iron, Calcium, Magnesium, Phosphorus, Potassium, Selenium, Chromium, Zinc, Manganese. Amino Acids include Lysine, Arginine, Glutamic Acid, Methionine. Magnesium Stearate, Stearic Acid, Food Glaze. vita balance has been scientifically blended to help support the immune and digestive systems. Vitamins and minerals, alongside a healthy diet, can help prevent conditions such as heart disease and osteoporosis. Full spectrum blend of essential vitamins and minerals including 20 botanical herbs. Provides nutritional support for hundreds of metabolic processes in the body. Amino Acids - intestinal health, gastric function, immune system support, detoxing and reduction of fat. vita balance contains no artificial flavourings or artificial sweeteners. Begin your day with 1-3 proto-col vita balance tablets. This can be increased to six tablets if your stress level is high. 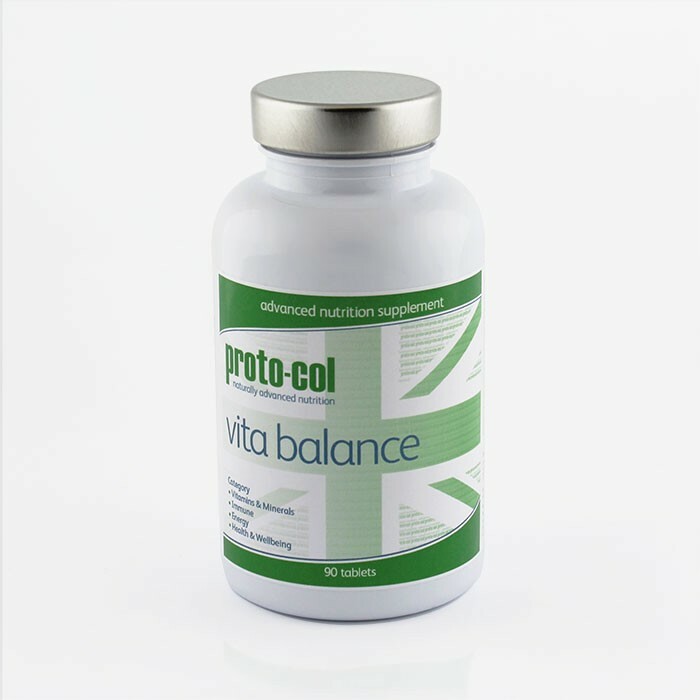 Because proto-col vita balance dramatically improves oxygen utilisation it is best taken in the morning or early afternoon.